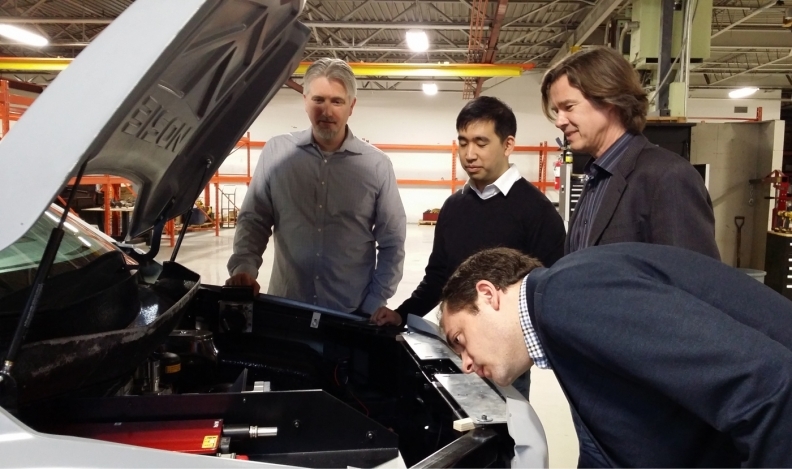 Havelaar Canada's VP Engineering Nathan Armstrong, left, UTEV's Theo Soong, Professor Olivier Trescases and Professor Peter Lehn look under the hood of Havelaar's electric pick-up truck, The Bison. The University of Toronto’s Electric Vehicle Research Centre has received $9.1 million to support the research and development of electric vehicle technology and more affordable EVs. The money will be used for two projects over four years and comes from separate donations from federal government and electric pickup maker Havelaar Canada. The government’s portion comes from the Natural Sciences and Engineering Research Council of Canada, which supports post-secondary students and encourages Canadian companies to participate and invest in post-secondary research projects. The University of Toronto Electric Vehicle Research Centre is a university-industry partnership focused on the development of technologies for EVs. The researchers will use the money to develop next-generation technology that addresses the concerns of current and potential EV owners. Some of those concerns include driving range, the cost of an electric vehicle and charging availability for the everyday consumer. The projects are designed to make next generation of EVs more accessible, affordable and intelligent. UTEV is also currently expanding its research laboratory, with an additional state-of-the-art facility expected to open in 2018. The space will include power test infrastructure for battery management and power electronics prototype development.